"Priceless sunsets await the lucky new owner of this rarely available line at Five-Star Turnberry Tower." This "D-line" two-bedroom condo on the 7th floor at Turnberry Tower is generating great enthusiasm and excitement among potential buyers and agents. Step directly into the unit from the private elevator and prepare yourself for spectacular sunsets and Potomac views from one of the largest balconies in the buildling. 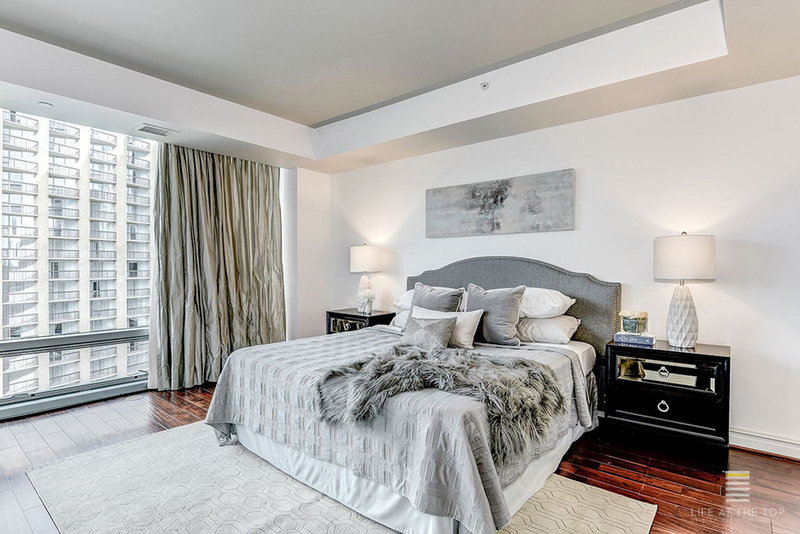 Turnberry Tower is the tallest luxury condominium building in Metro DC and a Life At The Top "It" Building in five categories including Most Modern, High Demand, Best Private Outdoor Spaces, Best Views, and Most Luxurious. Boasting contemporary refinement and every conceivable luxury amenity, the open floor plan incorporates walls of floor-to-ceiling windows and sliding doors to create airy and modern living spaces full of natural light. The western side of the building is most preferred for its quiet, and soothing sunny exposure. The gourmet kitchen includes Snaidero Italian cabinetry, under-cabinet lighting, granite countertops, and Miele stainless steel appliances with gas cooking and Sub-Zero refrigeration. The sumptuous European marble bathrooms include Snaidero Italian cabinetry, granite countertops and Dornbracht plumbing fixtures with Jacuzzi hydrotherapy tubs. The large glass-enclosed seated shower features dual showerheads. The master and second bedroom both include access to the huge balcony. Total square footage is 2,066 including the 314 square foot balcony. Within the sumptuous two-story lobby, you're served by a 24-hour front desk, full-service concierge, professional security personnel, and on-site management and maintenance staff. The 24-hour valet service takes your car from the porte-cochère to the underground parking garage. A quick tap on your phone’s private Turnberry app retrieves your car so it’s waiting for you when you depart. Your guests also receive complementary valet parking when they come to visit. The unmatched private health and fitness club features state-of-the-art equipment, fitness classes, private yoga/pilates studio, personal trainers, and spa services. You can unwind in the glass-enclosed heated swimming pool with hot tub or on the adjacent outdoor sun terrace. Invite guests to the private theatre room where you can screen movies or binge-watch your favorite shows. Unwind or entertain large parties in the luxurious social room with pool table, wet bar and catering kitchen. Turnberry Tower is located in Rosslyn with its own Metro stop on the Orange and Blue lines. It's a great walkable location, or an easy Uber ride to just about anywhere. Access to DC, the beltway, National Airport, Dulles International Airport and points beyond is easy with major thoroughfares within just a couple blocks. At Turnberry you’re just minutes away from historic Georgetown, Key Bridge, Foggy Bottom and a short Metro ride to Washington's business corridor, the Capitol and Ronald Reagan National Airport. Many new restaurants, shops, and even a new grocery are being added into the rapidly redeveloping Rosslyn neighborhood. You can even walk into Courthouse and Clarendon where a multitude of shops and restaurants await, or across Key Bridge into the heart of Georgetown for the city's finest dining, shopping, theater and the arts.